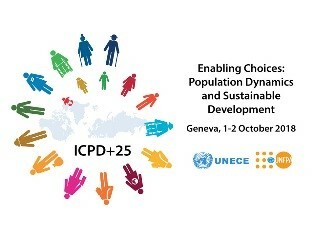 UN Commission on Population and Development (CPD) will celebrate in April 2019 25 years since the International Conference on Population and Development. In 1994 in Cairo, at the International Conference on Population Development (ICPD), representatives from 179 governments and other stakeholders adopted a landmark and far-sighted plan to advance human well-being by placing the rights of individuals at the centre of the global development agenda. The ICPD Programme of Action emphasized the value of investing in women and girls and affirmed the principle of sexual and reproductive health and rights for all. As part of this, all governments are participating in regional and global consultations aimed to share the progress of ICPD after 25 years and set new ambitious commitments within the 2030 development agenda. UNFPA Regional Office for Eastern Europe and Central Asia and United Nations Economic Commission for Europe are undertaking a regional consultation on ICPD in the EECA region on 1st and 2nd October 2018. It will focus on key actions for implementation and address the wider policy concerns related to three main themes: (i) population dynamics and sustainable development; (ii) families, sexual and reproductive health over the life course; and (iii) inequalities, social inclusion and rights. To prepare the statement and learn on Moldova’s achievements in the framework of ICPD, a national consultation event will be conducted with all relevant stakeholders. Take stock of the Moldova’s progress in the framework of the ICPD@25 and set its key messages and way forward for the regional and global consultations for celebrating 25 years of Cairo’s agenda. Consult national stakeholders on the last 5-years achievements in implementation of the International Conference on Population and Development principles and lessons learned in overcoming challenges. Set clearer linkages and commitments of the ICPD agenda as part of localized SDGs. Identify policy priorities that will support Moldovan Government in accelerating progress of the ICPD agenda as part of SDGs. The results of national and regional consultations would be used for the global appraisal of ICPD and 52nd UN Commission on Population and Development that will take place in April 2019. The event aims to bring up to 40 participants, representatives of Parliament, line ministries, civil society organizations, academia and mass-media. The Parliamentary Commission on Health, Social Protection and Family jointly with UNFPA Moldova will send a common invitation letter to all participants, stating the importance of this national event and the role of participating institutions. The event will take place on 20th September 2018, with a duration of up to 2 hours, in the Parliament’s venue.